Portable AC cools a room and removes humidity via the included hose kit and is on castors allowing the unit to be moved from room to room as needed. Energy efficiency is combined with economical cooling in our compact room air units featuring environmentally friendly R410A refrigerant. Decorator grills come in a neutral stone white finish to blend with any dicor, while lightweight cabinets are durable galvanized steel. Haiers Eco-Conditioner has been top rated for its innovative and environmentally friendly materials. More than just an air conditioner, the Paragon cleans the air of allergens, dust and odors, while being safer for the ozone and uses less energy than other similar air conditioners, making it an earth-friendly choice for home comfort. Rising temperatures outside have nothing on your indoor comfort with this 6,000 BTU window air conditioner from Perfect Aire. You'll be cool as can be with the temperature adjusted to your ideal setting at the touch of a button. Electronic pad controls and a digital LED display make it easy. Roam anywhere in the room and cool air will follow, thanks to full-range air direction control and three speeds for cool and fan modes. With an Energy Star rating, this unit is as energy efficient as it is effective. The RIDGID AM2286 Air Mover is designed for Pros and DIYers who want high volume air movement to tackle a variety of tasks. The 2/5 horsepower, 3-speed heavy-duty induction motor generates 1625 CFM (cubic feet per minute) of airflow that is dispersed quickly over a large area. The AM2286 is a versatile blower that can be used to quickly dry a variety of surfaces such as wet floors, wet carpets or rugs, wet paint or stains, and drywall mud. This Air Mover can also help ventilate workspaces by quickly circulating air, creating a cooler and cleaner working environment. The stackable design allows you to easily stack two units for storage or transport. A versatile tool that is perfect for cleaning or plumbing professionals, contractors, and DIYers. Accepts RIDGID Carpet Clamp AM1001 (sold separately) that attaches to the Air Mover to 'float' carpet or rugs over the blower for faster drying. 8000 BTU Portable Single Hose Air Conditioner Portable AC cools a room and removes humidity via the included hose kit and is on castors allowing the unit to be moved from room to room as needed. 8000 BTU Portable Single Hose Air Conditioner is rated 3.0 out of 5 by 5. Rated 5 out of 5 by Helen from Air conditioner The air conditioner works well, not too loud, and is also good as a fan. great product! Rated 1 out of 5 by Bob55 from Useless! Although the unit cools efficiently, the design is completely useless. The condensation pan at the bottom of the unit is so small that it needs to be drained almost every hour, and the location of the drain (at the bottom of the unit) means it cannot be drained into a bucket or other container. The unit cannot be left on all day while you are away, because the pan needs to be drained so regularly (the cooling unit shuts off when the pan is full), unless the unit can be located directly over a floor drain. BAD design! Rated 5 out of 5 by KASMAK from Excellent air conditioning! I had bought this air conditioning from the Home Depot online and got free shipping. It took a while to get since UPS had a tough time bringing it up three flights of stairs. Overall the A/C is working excellent, it cools down a large bedroom (approximately 15' x 15') fairly quickly and it is quiet for a portable A/C. I like the fact that, unlike many other air conditioners out there - this portable A/C comes with an upper level filter and a lower level filter. This particular model (PS-81A) has two drain hoses. One is a continuous drain hose used for the constant drain of water deposit (located in the middle of the back of the unit). The other is connected to the drain pan which will fill up and beep with a P8 code indicating it needs to be manually drained with the hose provided. The Comfort Aire A/C is a great product, and the manufacturer has a legitimate website that can be accessed for warranty if need be. It says single hose, but reviewer says double. So, which is it? What are the noise levels for this product? Sounds like a fridge running with a little more compressor hum than most, very easy to ignore after first few hours. Can you shut off the dehumidifier? I live in calgary....we need as much moisture as we can get...so I do not need a dehumidifier. 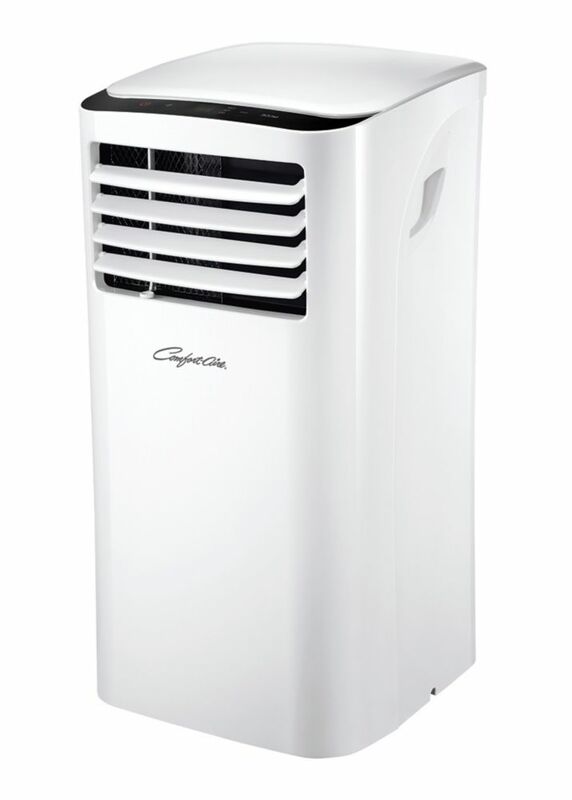 Mode switch settings... Auto, cool,dehumidify, fan....so yes don't need to use dehumidify.